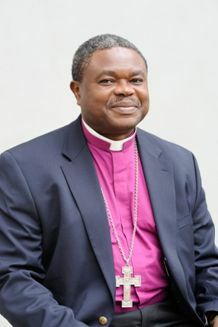 This statement was made by the Presiding Bishop of the Evangelical Lutheran Church in Tanzania (ELCT), Dr. Alex Malasusa, speaking on behalf of the Christian Council of Tanzania (CCT) at the requiem mass for three victims of a bomb blast that occurred at St Joseph Olasiti Catholic Parish in the Tanzanian northern city of Arusha on 5 May 2013. Bishop Malasusa said Intimidation using bombs, violent acts against the clerics, and torching of church buildings may persecute the church but such acts should not discourage you. You have put your faith in Christ who taught us: to live is Christ and to die is gain, quoting Philippians 1:21. You should not get scared and avoid going to church. He went on to say that he admired those who died during a church service for the blessed are they who die in the Lord, Revelation 14:13, drawing applause from the worshippers numbering in tens of thousands. Those who died, either on the spot or in hospital, are Regina Kurusei Laiser (45), James Gabriel (16) and Patricia Joachim (9). They were buried on 10 May 2013 on the very spot where the blast occurred and their graves will become a memorial site to remember the incident. The requiem mass was graced by Cardinal Policarp Pengo of Dar es Salaam Archdiocese and led by the Chairman of the Tanzania Episcopal Conference, Bishop Tarsisius Ngalalekumtwa who urged Christians not to retaliate. Bishop Malasusa was upset by the brutal attack on innocent worshipers at St. Joseph Parish in the Northern Tanzania city of Arusha and had to cut short his tour of a the ELCT's newly inaugurated South East of Lake Victoria Diocese in order to accompany the Vice President Dr Mohamed Gharib Billal, who was chief guest at the ceremony in Shinyanga, and to visit the bomb victims in various hospitals in Arusha on Sunday night, 5 May. Police had confirmed that 60 people were injured when a bomb exploded during a dedication service graced by the Apostolic Nuncio to Tanzania, Archbishop Francisco Padilla, who was to inaugurate the parish accompanied by Archbishop Josephat Lebulu of the Arusha Archdiocese. Archbishop Lebulu (right) next to Archbishop Francisco Padilla. He said during the interview that the cowardly act has now tarnished the name of Tanzania, a place that used to be considered a haven of peace for many decades since independence in 1961. In recent years, however, there is a rise in sectarian violence between Christians and Muslims. Following the murder of Father Evarist Mushi on the island of Zanzibar in February, this year, Tanzanian Bishops issued a statement through the Christian Leaders Forum in Tanzania calling upon the Government to take action against anti-Christian propaganda spread by a faction of Muslim fundamentalists. A statement by the Christian forum issued in March, to coincide with Easter this year, partially says: A few Islamists in Zanzibar disseminated an ideology asserting that the Islamic majority in Zanzibar (99 percent) should not tolerate any other religions. For that matter the leaders urge the government to take action to protect people who have now become targets. It feels that the Government has remained silent for too long hence giving room for propaganda and hatred to be spread against other religious persuasions, leaders of Christian forum said in their statement. The statement also called upon Christians to pray for peace and play their role in peace-building in the country. It seems few people have selfishly abandoned the tenets of peace. All stakeholders in peace-building, including political, civil and religious leaders; teachers; parents and members of the community as a whole, have not played their roles properly, he said. After having the opportunity to console the victims in their hospital beds, Malasusa said he was stunned and upset by the bombing in Arusha. He felt miserable when he saw young children and the elderly, whose only "mistake" was to turn up for a Sunday worship service, ending up being blown up by a bomb. It was reported in the local press that Police have arrested eleven people in connection with the attack. All ELCT parishes throughout Tanzania held special services on Sunday 12 May to honour victims of the bombing. 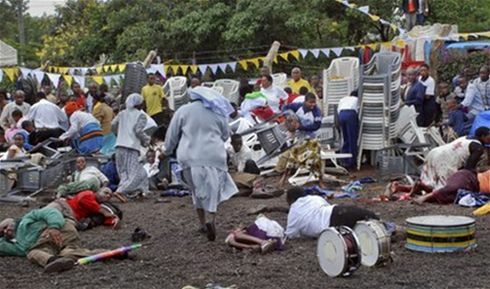 Worshippers at the St. Joseph Olasiti Catholic Parish in Arusha after the explosion. In recent years there have been attacks against Christians on the Island of Zanzibar and in some parts of the Tanzania mainland by people believed to be Islamic radicals who promised, in leaflets in January this year, that they would make more attacks particularly targeting Christian Church leaders. The bombing in Arusha follows the murder of a priest by Islamists in February this year and attacks on several churches in in Dar es Salaam in October last year after a teenage boy was alleged of urinating on a copy of the Quran. The 14-year-olds action supposedly occurred after a Muslim friend told him he would become a snake if he did so. Police arrested 126 people after attacks on churches. Mbagala Lutheran Parish was among seven churches attacked. In April of this year, 200 people purported to be Christians attempted to burn down a mosque in Mbeya in Southern Tanzania after allegedly being denied the right to slaughter meat for public consumption. In February, a Catholic priest narrowly escaped death after being shot in the head in Zanzibar.